Join the Pikes Peak Chapter of the Colorado Archaeological Society to learn about demographic decline in the Southwest and archaeological efforts to understand some of the causes during the 14th through 16th centuries – along with insights for the present and future. Demographic decline in the US Southwest, 1300-1499. Image provided by Scott Ingram, PhD. Population movement (migration) was a way of life in the ancient Southwest. People settled, lived, and often migrated to new locations, either founding new settlements or joining existing ones. 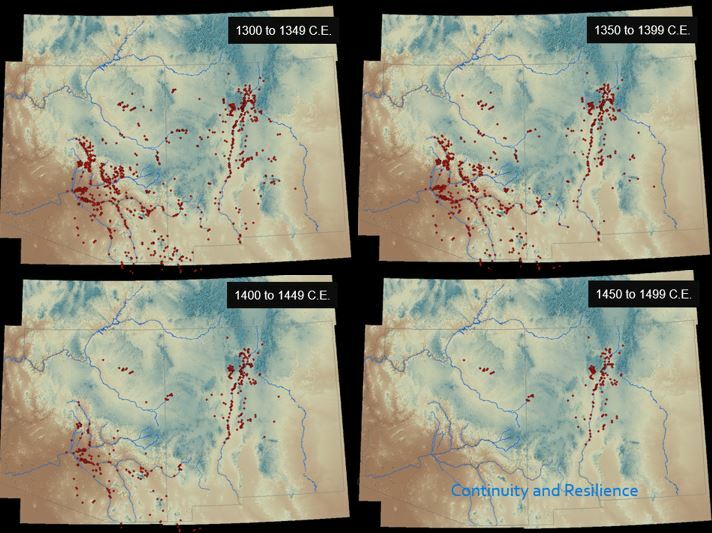 Some movements involved large numbers of people leaving well-established settlement areas, such as Chaco Canyon in the early 1100s and the Mesa Verde region in the late 1200s. In the context of both small and large movements, population levels in the US Southwest increased until the early 14th century, then began to dramatically decline. Given the urgency of local-to-global sustainability problems, understanding and interpreting this demographic decline is increasingly urgent.